IMGP1421.JPG, originally uploaded by flagondry. This native Australian tree is one of the more dramatic members of the Brachychiton familhy. As you can see from this picture it can be very dramatic when in bloom. In this case all the leaves have fallen just prior to blooming. This does not always occur though. 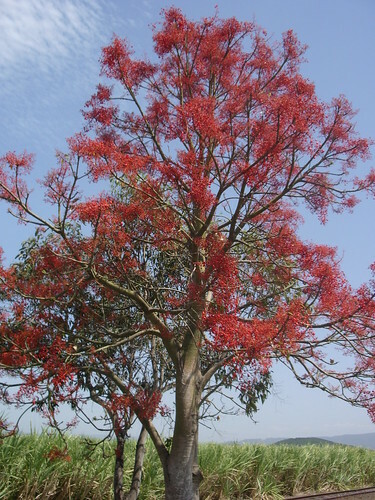 I have seen many Flame trees keep most of their leaves while in bloom and with far fewer flowers. When the the flame tree flowers fall to the ground they totally cover the surface with little red bells that look like drops of blood.